Victory for Team #Benderer as Roger Federer and Belinda Bencic won the deciding Fast4 mixed doubles 4-3 (3), 4-2 over Germany to give Switzerland their third Hopman Cup title and cap off a very enjoyable week in Perth. After Federer recovered from losing the first set to beat Alexander Zverev in the three sets the tie went into a deciding mixed doubles after Kerber took apart Bencic 6-4, 6-1. Fortunately, Belinda was able to rebound instantly, proving the perfect accompaniment to Federer's sharp net game with some blisterting returns off the Zverev serve to help take down the trophy. Check out Belinda's returning. Boom! More top drawer tennis from Fed in the singles and a clinical serving display as he fired down 16 aces and won 86% behind his first serve. Today was naturally the most serious match of the week and Zverev, in particular, looked like he badly wanted the win but Roger's ability to control matches and restrict Sascha's offensive options proved too great as he won through 6-7 (4), 6-0, 6-2. I'm not quite sure how he lost that first set as he had all the early running after saving break points in his opening games but wasn't able to convert any of his chances. Zverev then found some timely plays in the tie-break to take it but after that Roger really took control. Taking the ball early and running Zverev ragged with some majestic drop shots that forced him to eat a bagel in the second. The third was more of the same with Zverev looking all out of ideas as Roger swept the third set 6-2, sealing it with yet another drop shot. The Swiss Numero Uno has looked in fine fettle all week and all four matches have been great preparation for Melbourne. As a result he should have a firm idea of where his game, body and mind are all at headinintoto the first slam of the year. A very enjoyable week and I had a lot of fun watching the tournament this year. Roger is obviously the star attraction and the only reason many of us watched but I think the whole event looked really well organised. Matches started bang on the scheduled time (none of this Schedule listed as 5.30pm but players arriving on court at 5.40 and it being nearly 6 pm before a ball is hit in anger), the stadium provided a brilliant atmosphere and the mixture of quality tennis, on court banter, the off-court stuff around Western Australia & Rottnest Island kept things interesting and engaging for the fans both at home and the ones there live. What did you guys make of the Hopman Cup? Let me know in the comments. Awesome serving display. Should have won the first set but kept his level high and got Zverev moving to come through in three. Who will be Betterer ? You deserve a kiss ! Go for your twentieth ! What a performance by Federer even though he was sloppy in the 1st set. He went all JesusFed mode in 2nd and 3rd set leaving Zverev totally clueless and dumbfounded. This is a good workout for Roger and plenty of info going into his title defense in a week’s time. Happy to see Bencic recovered after her loss against Kerber. Both players really know how to use court angles and positioning their serves well like veteran doubles player. I also liked how much Roger trust Belinda to put away some overheads, allowing her do her bit. Oh boy did she GOAT on Zverev’s serves at crucial moment. Zverev was all over the place and overtook a couple of Kerber’s shots. A great event even though it was supposed to be exho but competition was on. Diamond balls does motivate one a lot… I remember seeing how Cornet eyes sparkles and salivating over it when France won a few years ago. Back to serious business – AO 2018 – god please let Roger have a good draw, no NK, no Delpo, no Zverev-es. Gosh Jonathan, you are quick. 3 adults and one big kid, hahaha! So right. I’m just recovering from this morning’s tennis and the whole week, I just love the Hopman Cup and it seems to bring out the very best in Fed. Great clock times for watching in the UK too. Those drop shots! Calm under pressure – lose a bad point, serve an ace or two – take that! Those unbelievable backhand volleys! Belinda Bencic was pretty good too. Also have you noticed that commentators love to talk about Fed even when other players are playing? Now I’m going to watch the Mixed Doubles again with no pressure. Yeah I get a bit bored of commies fawning over Fed. Repeat the same stuff over and over. They should tone it down. 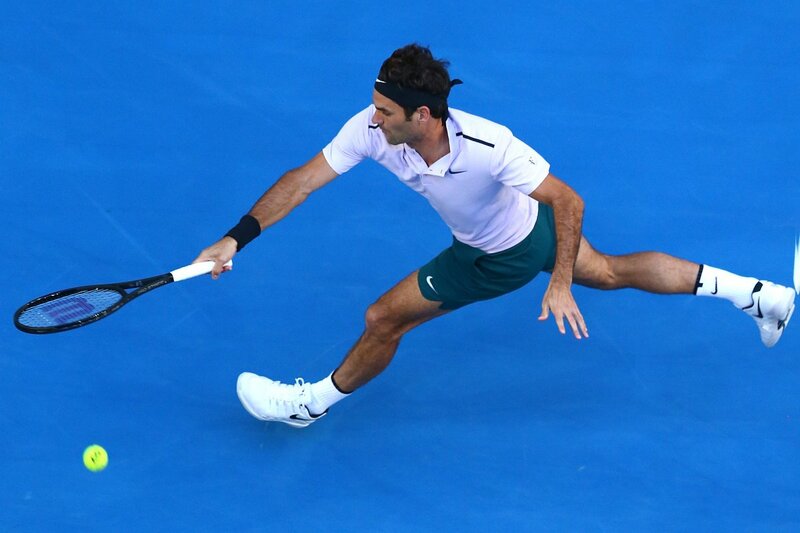 Perhaps you can throw some light on this – I have never seen Roger LOB when he was pushed to pass, all videos I see when he was pushed he only tires to pass instead of Lobbing. Maybe I am biased because I have not seen RF lobbing. But many many points he lost from many videos he would have won by lobbing stead of trying to pass. . What is your opinion? I don’t really have an opinion on it. Obviously, you can look at specific points that he’s lost and go ah should have thrown up a lob. We all know the right shot after he played the wrong one. But over a 20 year career, I don’t think a defensive shot like a lob vs a pass has made any material difference to his results. Chum Jetze! Go Roger! Should have won the first set but played amazing in the second and thirds and showed that Sascha isn’t a threat. What a great week of tennis. Sixteen aces and fifty one winners….impressive. Thanks for the write-ups! On to Melbourne and now let’s wait to see who shows up. Yeah stats have looked great all week. Absolutely loved the event. So great to see Fed and all the players enjoying themselves. It’s fundamental of the game, isn’t it? And he plays the best when he feels no real pressure. Having said that though, he’s been a clutch when he’s in any crucial moments in the whole week, very impressive. B Bencic looked genuinely loving to play along with Roger and played great, what a lovely girl! When Fed is around (and winning) everybody seems to be happy, the crowds, the staff and even the oppornents. The tennis world is kinda hanging on his shoulder, I feel. Thanks Jonathan for the extra work posting exho recaps. Nice fun week! Roger seems to be playing well and fitness wise he also looks great, I hope for GS20! I got up just before 4:00 am and saw the end of the TB and the next 2 sets. It was worth it! Fed seemed annoyed at losing that TB and he was not going to give that young whipper snapper any real opportunities from then on. When Fed is playing like that, doing everything so well, including those terrific drop shots, his opponent does not stand a chance. And his net skills shine in a doubles match. I thought he and Bencic played well together. Unlike Sascha, Roger did not try to take over shots that were best played by his partner. And of course Sascha made a hash of several of those, he should have let Kerber take them. Anyway, a great day for Fed fans, and it was so nice to see Belinda back in the loop, after the injuries and surgery. Yeah Eurosport weren’t great. There were 2 streams, one had Petchey and he’s pretty good. But the others were talking way too much. Great week. Roger looks well prepared and ready to go, might take a few days off as I believe he starts next Tuesday? Still 9+ days for Melbourne. So plenty of time there. Damn the courts were perfect for Federer. Medium fast? 40+ CPR? Looked pretty fast to me. Hoping for similar conditions at Melbourne. Sigh! some of those and volleys and drop shots he played throughout the week were breathtaking. P.s Belinda s returns to zverevs 125mph+ serves were stood out for me today!! Great exho, great prep and ace reporting J! Loved the mixed today even Sascha cannot play dubs for toffee! Belinda returning and net play was excellent and Fed just never stops moving at net keeping the oppo guessing. 4 singles, super prep, service in fine fettle and winners way out numbering errors. Movement good too. 20 is coming!! Still not sure if ND or Stan will make Melbourne. Novak is all talk at the mo..
Ps Yes I loved that Hopman started bang on time! Haha yeah to say he’s played a lot with Mischa he was a bit all over the place. Trying to take over shots Kerber had a play on. Yeah other tournaments should take note re starting time, never to schedule. I don’t mind it at Aus day sessions or US Open night though, means I can set my alarm for the match start time and still get 10 minutes to wake up! Great confidence booster for the defence of his Australian Open exploits of last season. Happy new year Jonathan and all Federer and tennis fans. What amazing feats will the great legend offer us this year. A 20th plus Grand Slam titles I hope. Whatever happens it’s always a pure joy just to see him display his genius on the court. A joy for many of us on this wonderfull site. What a great start to 2018. A happy new year to everyone.Fed could not have had a better start to 2018,playing with such confidence and enjoyment.As for the AO it all comes down to the draw as always.Delpo is always the one who worries me.Does anyone know when the draw will be? The tournament’s singles draw is conducted during a special event at Margaret Court Arena on Thursday 11 January. Men’s singles: 128 competitors including 16 qualifiers and eight wildcards. Roger Federer is the defending champion. (Yes, he is !). I don’t think the draw makes much difference at all. He’s had cakewalks and lost early, he’s had a seemingly tough path that’s opened right up.